So you're interested in joining? We would love to meet you. 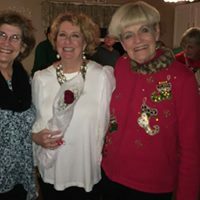 If you like to sing and would like to discover "women, real harmony, and real fun" start by contacting our Membership Director to let her know that you will be coming and when. You will be able to join us in our warm ups and then on the risers where you will have the opportunity to join us singing our four-part harmony. No pressure. You can merely follow along with the music and join in when you are comfortable. You will not be asked to sing by yourself or audition during your visits. Come check us out and see if you like the music, the fun and the friendship or our group. Please email us to let us know you're coming so we can properly welcome you.